The leader of the pride. He rules over the other animals of the Pride Lands, his savanna kingdom. He roared onto the scene in "The Lion King" (1994). Successor to his father as ruler of the Pride Lands. Sora need only call and Simba will appear and lend his strength. Son of the great Mufasa who grew up to succeed his father and rule the Pride Lands. As a young cub, Simba mistakenly thought he was responsible for his father's death. He left the Pride Lands and met two new friends: Timon and Pumbaa. They taught him to lead a carefree life. During their first quest, Simba helped Sora, Donald, and Goofy whenever they called on him. The king of the Pride Lands, Simba follows in his father's footsteps. A friend that answered Sora's call through the power of the Heartbinder. "You can all come out now... I'm going back to face my past. I could use your help." 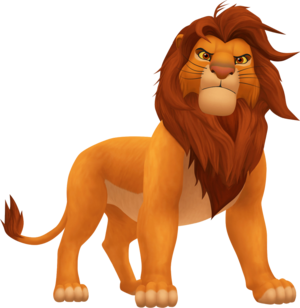 Simba is a recurring character in the Kingdom Hearts series, serving as a Summon in the first game, a party member in the second, and a Summon in the third. He is originally from Disney's The Lion King. Simba's power is channeled by the Book of Prophecies to create the Simba medals. Simba appears as a Summon, using an attack called Proud Roar where Sora charges up the roar and fires off a powerful attack. Though the Pride Lands were destroyed, Simba's strong heart refused to languish in darkness, keeping his spirit alive and turning him into a Summon Gem, Earthshine. The gem was in turn found by Leon, who kept it as a "lucky charm", and was eventually given to Sora after Leon told him about the hearts of worlds. After bringing it to the Fairy Godmother, she recognized it as a Summon Gem and immediately restored Simba's spiritual form, making him able to assist Sora in battles. After stopping Ansem, Seeker of Darkness, Simba's body was restored and he returned to his own world. Simba reappears as a figment of Sora's memories, and he is once again a summonable character. He is the first Summon Card that Sora receives, given to him by Leon after finishing his tutorial and visit to Traverse Town. Simba being haunted by Scar's ghost. While resting in an oasis with his childhood friends Timon and Pumbaa, Simba was surprised to see Sora, Donald, and Goofy in the Pride Lands, and that the three looked very different from when he last saw them, as they had taken on animal forms. He was even more amazed to find out that they had met his childhood friend, Nala. Sora, Goofy, Donald, and Nala attempted to convince Simba to return to the Pride Land to overthrow Scar; however, Simba resisted until he met the spirit of his father, Mufasa, who helped him rebuild his confidence. He returned to Pride Rock to find that Scar's hatred had turned Scar into a Heartless. After a battle on the top of Pride Rock, Scar was defeated, and driving the hyenas out, Simba took his rightful place as king. Simba, Nala, and Rafiki present the newborn cub to the animal kingdom. However, the appearance of Scar's ghost caused Simba to have doubts, which made the other lions question his abilities as king. The apparition of these ghosts made Simba wonder if he could be a king just like his father was. Sora convinced Simba to follow his own path, and not his father's. With Sora's help, he was able to overcome these fears, defeat The Ghost of Scar, and become the king he was meant to be. After Xemnas's defeat, Simba is seen standing on Pride Rock, with Rafiki holding his cub aloft to present to the kingdom. Simba appears as a summon. He can be summoned after obtaining the Pride Heartbinder. Simba is a courageous, yet occasionally low self-esteemed ruler. He knows of his duty to rule the Pride Lands, but his fear of failure and disrespect often causes him to not do as well as he can. He is shown to be unself-reliant, always wishing he knew what his father would do in times of crisis, seldom thinking for himself. Simba doesn't have his priorities straight, and is constantly looking to do the right thing, but always says he fails of living up to his father. In short, Simba is a caring, brave and good friend, who is always looking to do the right thing. Young Simba as he appears in flashbacks in Kingdom Hearts II. As an adult male lion, Simba bears a great resemblance to his father, Mufasa, the only significant difference between the two being that Mufasa's mane is longer, thicker, and darker. Simba has yellow-orange fur covering most of his body, except for his belly, paws, and mouth, which are peach-colored. His mane is rust-colored and parts on the right side of the top of his head. He has a tuft of fur the same color as his mane on the tip of his tail. Simba's eyes are orange and his sclera are yellow. His ears are partially visible poking through his mane, and he has eight dark whiskers; four on either side of his upper lip. Upon summoning Simba in Kingdom Hearts, Simba appears in darkness, and bears resemblance to his father Mufasa, until he steps forward and is revealed in light. 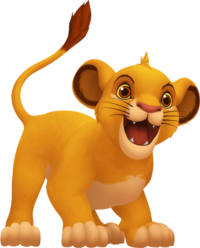 When he is briefly seen as a cub in Kingdom Hearts II, Simba appears significantly different. His yellow-orange, adult fur is now pure yellow, he lacks his mane entirely, and the brown tuft on his tail is a bit less wild. Simba has large, circular ears that are rimmed with black as a cub and a scruffy patch of fur on the top of his head. Finally, he is, of course, much smaller in size than he is as an adult. Simba, when summoned, replaces the bottom command with Proud Roar, which can be charged. When charging, a ring grows around Simba. Any Heartless in the ring will be damaged when the attack is release, each time lessening the summon gauge. When the summon gauge runs out, Simba will be dismissed and the party members will return. Simba appears as a summon card after clearing Traverse Town's Room of Beginnings. When his card is used, Simba appears in battle and roars to deal damage to enemies in front of him. Stocking multiple Simba cards create the Proud Roar Lv2 and Proud Roar Lv3 sleights, which stuns and increases the damage dealt to enemies. The Simba card is essential in activating Shock Impact, Quake, and the standard combination of Terror. Additionally, Simba can be used as part of magic sleights that require the use of any summon card, including Confuse, Gifted Miracle, Tornado, and the Halloween Town-exclusive version of Terror. Simba is a primarily offensive party member that uses his claws and fangs to wound the enemy, although, like Tarzan, he can heal using herbs and animal knowledge. He is an agility-focused fighter, but with good strength and defense. He has no armor slots, two accessory slots and three item slots. He has a varied range of action abilities with Fierce Claw and Groundshaker being vicious attacks, and the restorative Healing Herb spell. His limit, King's Pride, is a savage offensive that triggers shock waves and high speed attacks, culminating in an aggressive roar. Simba's support abilities include MP Rage, Defender, Auto Limit, Hyper Healing, and Auto Healing. Simba is obtained as a summon for defeating the mid-boss of Monstropolis. His Link is known as King's Flare. Sora rides the back of a large fiery Simba. Simba can pounce on enemies with Firaga Leap, as well as let out Firaga Roar. Simba originates from the Disney 1994 film The Lion King, later appearing in the sequels The Lion King II: Simba's Pride and The Lion King 1½, and the upcoming live-action remake The Lion King (2019 film). In the beginning of the film, Simba is presented as the newborn cub of Mufasa, the Pride Lands' ruler, and his wife, Sarabi, by Rafiki to the entire animal kingdom. A rambunctious Simba grows up happily with his best friend, Nala, anxious and thrilled for the day that he will become king like his father. Mufasa teaches Simba of the responsibilities he will have to bear as king. Simba's jealous uncle, Scar, plans to kill Simba and his father to ascend to the throne. Luring Simba into a trap that costed Mufasa's life, Scar manipulates Simba into believing he was the blame for his father's death. Scar sends his hyenas after Simba to kill him for certain, but he was able to escape into the desert. After Simba collapses from heat exhaustion, he was found by Timon and Pumbaa, where Simba spends the next few years with them, and learning about their lifestyle in the jungle and their "Hakuna Matata" philosophy. Although Simba grew up fairly happy with his life, he is still plagued with guilt over his father's death. One day, Simba is reunited with Nala when she is chasing Pumbaa for prey. During a romantic evening between the two, where their feelings for each other were made apparent, Nala tries to convince Simba to return to the Pride Lands to free it from Scar's tyrannical rule, but Simba refuses. When Nala storms off, Simba meets with Rafiki and his father's ghost, encouraging him to not run away from his past and accept his rightful place as king. Simba heads back to the Pride Lands with Nala and the others, immediately searching for Scar to reclaim the throne. On top of Pride Rock, Scar forces Simba into admitting his role in Mufasa's death in front of the rest of the clan. However, after Scar reveals to Simba that he was the one that truly killed Mufasa, Simba coerces his uncle into confessing the truth to the lions. Simba was able to defeat Scar and reclaim the throne the Pride Lands. By the time the lands have been restored to its former glory, Simba and Nala are mated and a presentation ceremony was held in honor for the birth of their daughter, Kiara. "Simba" means "lion" in Swahili. This page was last edited on 1 April 2019, at 21:08.